All fantasy games are not created equal! At Scoresheet Fantasy Football, we do not simply give points for touchdowns and yards gained. Instead, we offer a unique fantasy game which reflects virtually everything that happens on the field. With Scoresheet Fantasy Football, you'll play a game with the most complete scoring system you’ll find anywhere. Our formulas are designed to reflect a player's real football value, and are derived from established mathematical models of football. 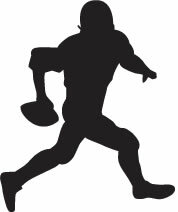 For instance, in Scoresheet Football, a running back who gains 100 yards on just 20 carries will earn more points than one who gains 110 yards on 30 carries. And unlike other ‘fantasy football’ games, in Scoresheet Fantasy Football, individual defensive players are drafted and score points! No other fantasy football game plays at this level. And the best part is that our computer system does all the extra statistical work - all you have to do is enjoy the game. It is no harder for you to play a more realistic game such as ours - it is just more fun! Unlike some fantasy football systems, in Scoresheet Fantasy Football, you will play in real leagues, with a real draft. Scoresheet is not a 'pool' game or national 'contest', where every owner in your league can have Tom Brady on his team. At Scoresheet, you will be competing against, and talking trades with, real football fans like yourself. Considering how many hours you spend following football each year, you owe it to yourself to play the very best fantasy game you can. As a team owner of a Scoresheet Fantasy Football team, you will draft a team of NFL players, make real trades with other owners in your league, pick up free agents, and decide who plays and who sits each week. You will play head-to-head games against other teams in your league as you compete for the league title. Before the season begins, you will draft individual players from the NFL, putting together your own team. Then, each week of the NFL season, your team will play one game against another team in your league, scoring points based on your players' actual stats from that week's NFL action. As you watch one of your players complete a pass, rush for a big gain, record a sack, or make an interception, you'll know he is also scoring points for your Scoresheet Fantasy Football team. Preliminary game scores are posted to the web each Monday before that night's game is played so that you know where you stand. At Scoresheet, we don't employ the same basic scoring systems you see in other fantasy football games. Instead, we offer a unique fantasy game which reflects virtually everything that happens on the field. In addition to the offensive player positions you would expect, you will also draft and play individual defensive players, earning points for their sacks, stuffs, interceptions, tackles and assists. To add to the realism, Scoresheet also takes away points for incomplete passes and interceptions. Our top priority is service. With over 30 years of experience in the fantasy sports field, you can count on Scoresheet to be there all season long. Every week of the season, you'll receive complete reports that include: standings, scores, team and individual stats, trade reports and lists of top undrafted players. Weekly results are both posted to the web and sent out (by e-mail or postal mail - your choice) promptly each week. Our drafting system gives you the most flexibility and control possible. You can draft on the Scoresheet website, using a system that allows you to adjust your draft list as often as you like - between every pick if you desire. While playing Scoresheet Fantasy Football ,you will follow the NFL like never before, since every NFL game potentially involves players on your team. 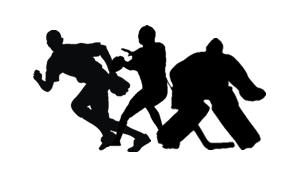 You'll even appreciate your favorite team's strategies more, because you'll know all of the opposing players better. We feel certain that playing Scoresheet Fantasy Football will make the upcoming NFL season your most enjoyable football season ever. Join alone, and we will place you in a league with other individual owners, giving you a chance to compete against some of football's biggest fans. Or, join with friends, and you can talk trades and assert bragging rights whenever you get together. If you know enough fellow fans to form a complete league, you can hold your own draft - the best party of the year! If you join with friends and want to play among yourselves, you can form a complete league of any size, though we suggest having at least 6 and at most 16 teams. Owners who form their own complete (private) league can either hold their own draft, or have Scoresheet run their draft. As soon as we receive your team order, we will send you a draft packet that includes a list of the NFL's projected starters at every position (except offensive line). We will include each player's point rating from last season, including season and points per game totals along with each player's age and position. You will draft a team of 6 offensive starters, 6 defensive starters, a kicker, a punter, a kick return team, and 15 backup players. Unlike contests or pools, this is a real draft - a player can only be on one team in each league! The first web draft leagues will be formed and start drafting in late July, and Scoresheet will continue forming new web draft leagues throughout August. The earlier you join a Scoresheet league, the sooner you can begin enjoying the fun of drafting a team. No matter when you join, your final picks in the web draft will be in the first week of September, when NFL teams have finalized their rosters. If you have a complete league of owners, you can choose to do your own live draft, holding it whenever you like. On your depth chart, you'll list 15 starters, along with up to 15 backups. The flex position allows you to decide which additional starter is best for your team. That can be an additional running back, wide receiver or tight end. This gives you the same kind of lineup flexibility as the pros! Your backups will play if your starter is hurt, or does not play for his NFL team that week. In Scoresheet Fantasy Football, you do NOT have to turn in a new depth chart each week - injuries and byes are taken care of automatically by your designated backups. Scoresheet will even substitute for players who are injured during the game! Each week, we'll hold a free agent draft of available players, with the team that has the worst record choosing first, second worst drafting second, etc. You will be able to use free agents as soon as you acquire them. Trading is another a great way to build a team. Scoresheet will provide you with contact information of the other owners in your league. We monitor all trades for fairness, and no trades are allowed after the 11th week. This opportunity to make real trades with other owners can be one of the most fun aspects of Scoresheet Fantasy Football. The the joy of trading is totally lost in other game systems where owners can simply pick up any players they want, even if those players are already on another team in their 'pool'. For point system and scoring formulas, see the Scoresheet Fantasy Football Scoring System Details. Automatic subbing for players who are injured or have byes. We even sub for players who are injured during games! Unmatched customer service. Unlike many internet-only companies, if you call us you will be able to talk to a real person! At Scoresheet, we operate a full-time business servicing over 8,000 customers a year across the U.S. and Canada, and you can be assured that results are always on time. Scoresheet helped pioneer fantasy sports, and we have been featured nationally in such publications as USA Today and Fantasy Football Magazine, and on several sports talk shows and in many daily newspapers. Considering how many hours you spend following football each year, you owe it to yourself to play the very best fantasy game you can. At Scoresheet, we have worked very hard so you can do just that! Our success over the years has been due to repeat business and word-of-mouth advertising from satisfied owners. Owning a Scoresheet Fantasy Football franchise costs just $54. If you join in a group of 4 or more, the price is only $49 per team. We will send you complete drafting information as soon as we receive your team order. If you have enough people to form a complete league, give us a call and we'll help you set up an in-person draft. And as long as you use our web site's lineup card feature to make changes, there is NO charge for turning in new lineups, making trades or picking up free agents. This means your franchise fee pays for the entire season as long as you submit your weekly moves through the Scoresheet website. We hope you'll join the thousands of Scoresheet Fantasy Sports owners who feel we offer the absolute best in fantasy games. As some of our customers have told us, "Scoresheet is a great entertainment value," "it just gets better every year," "Scoresheet is far superior to pools and contests." 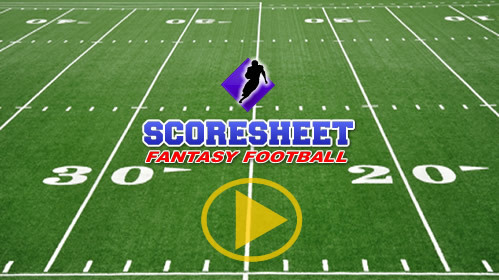 We are sure that if you enjoy following the NFL, you'll love Scoresheet Fantasy Football!